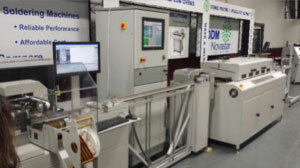 As a USA manufacturer of precision SMT assembly equipment for over 30 years, DDM Novastar is able to design, engineer, fabricate and test virtually any type of custom machine imaginable for the PCB and SMT market, from continuous reel-to-reel systems to custom pick and place machines. Plus, all of our machines, both standard and custom, include fully welded structural framing, not bolt-together assemblies that can drift out of alignment over time, eliminating costly and time consuming calibration and reducing the potential for product rejects. Because we design and manufacture almost all of our own circuit boards, you're never dependent on third-party vendors if you ever need to replace or update a board. This is an especially important benefit to a custom machine buyer. Contact us to inquire about a custom machine for your unique application!